You are exactly right, they are sabinos, but they are loaded with black "mottled" skin all over, it's really easy to see when they are wet. UC Davis is developing a test for LP --the hoves, eyes and skin part of the Appy pattern. The location of the gene(s) was found by the folks of the Appaloosa Project. The AProject folks think that there are two factors that make up a patterned Appy. LP and a pattern gene. If only LP is present, the you get a roanish looking horse. Just the pattern (without LP) a solid horse. It takes both to create the appy color patterns. Your horses are most likely Dominant White, or that's what most folks think Airdrie Apache is. They haven't found his specific mutation, but it acts like DW. Lovely horses. I have found I have to watch who I say the words "dominant white" to when selling. 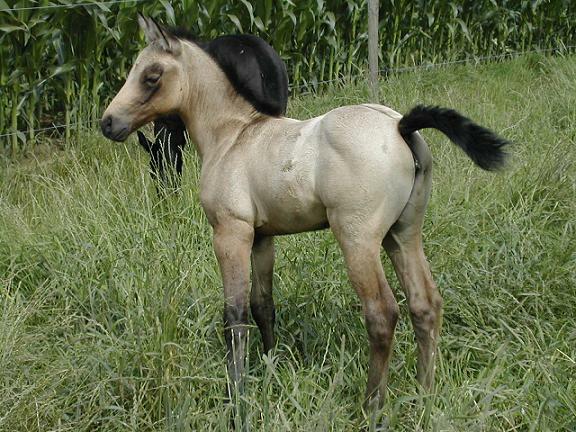 I find that "sabino" is still a mystry to sooo many people but more easily understood and heard of by folks from about other breeds.........and I "don't feel the door shutting in my face" when I mention DW, but I do hear pauses in people's voices of "what is that, or is this colt or filly only going to produce white"? No matter, really because I always tell them they can produce solids, loud, to white, 50% of the time and 98% of the time when mated to certain bloodlines. Then they are usually at ease. My preference are the loud marked DW's or 1/2 and 1/2's........but a solid white and anything in between can also be breath taking if the individual is really good. made me remember this topic. And the folks doing the research are making the leap that if the LP gene is present, then so are the spots? Leopard complex spotting occurs in several breeds of horses and is caused by a single incompletely dominant autosomal locus, LP. That statement can be interpreted as no other gene necessary. It's my understanding that the theoretical PATN, which might be multiple genes, is responsible for the distribution of LP markings in the Appaloosa. Don't most of the other breeds in which LP is found exhibit 'allover' or maximal spotting? I really don't understand what you're trying to say about The Appaloosa Project's theories Xfactor....???? Nobody knows for sure XFactor. We know that LP and PATN are both required for pattern spotting (versus just marble roan). We know that in most of the breeds that carry LP, all or most PATN genes are present because most have all patterns. However we also know that LP and PATN can be bred out of a breed separately. First you have to choose for no patterns, something that PRE and Lusitanos have probably accomplished already (I say probably because there could be a patterned horse lurking somewhere). LP is harder to get rid of because it can be covered by grey and owners would simply hide those horses out back until the grey covered the LP roan! LP can also be expressed very minimally (as American stock horses have found out!) and thus be carried on "under the radar". But it too can be bred out if eyes are sharp! The Appaloosa breeders in the USA are doing their best it seems to breed both out! In breeds where LP is just existing (TWH) you can usually trace its very existence to a grey horse covering it. But you are not going to find the LP gene in a thoroughbred. There is no evidence that it ever existed there. Not surprising considering where the TB was developed. As far as the prehistoric horses go I believe that the evidence for pattern genes (there are probably at least 3) is the patterns on the horses in paintings. The LP is what they were testing for. Someday they may be able to test for Pattern genes too. I know that one pattern of Appaloosa markings will produce nothing but Appaloosa markings, the few spot leopard. Appaloosa has many modifiers. A few spot will appear solid white, with perhaps a handful of spots. One few spot I have seen personally was Prince's Jim, who had 3 spots on one shoulder and no other markings. He was a son of Prince Plaudit, a reknowned sire. 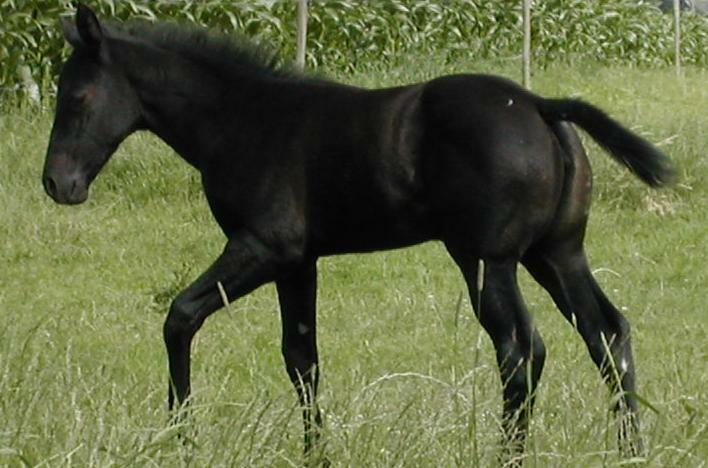 Correct, however, a fewspot can produce minimal.. to mighty loud foals, depending on the "patn" gene/allele which governs the amount of LP displayed. take a Look at our two foals from this year.. both out of fewspot dna tested LP/LP (homozygous) mares. Wow, quite impressive beautiful equine.